This past September, 13,000 Canadians in more than 80 communities laced up their running shoes, filled their water bottles, and came out in support of the 18th annual SuperWalk for Parkinson’s. They raised $2.4 million for Parkinson’s research and support programs for Canadians living with Parkinson’s. A staggering $1.1 million was raised through Internet pledges, with resourceful walkers soliciting donations from as far away as Scotland, South Africa and Australia. “The beauty of the online system is that we’re able to get donations from around the world and tap into a broader network of people,” says Beverly Crandell, Parkinson Society Canada’s National Director for Resource Development. 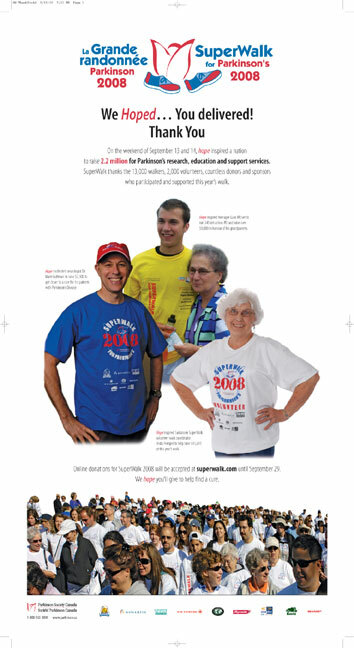 The next SuperWalk takes place on September 12-13, 2009. Kenny Bearg begins his annual fundraising drive every July and makes sure he’s up to the physical demands of the SuperWalk by going to the gym every day at 6:30 a.m. Since he was diagnosed with Parkinson’s in 2003, at the age of 51, Kenny has not missed a single SuperWalk. He has raised about $250,000 over the past six years.